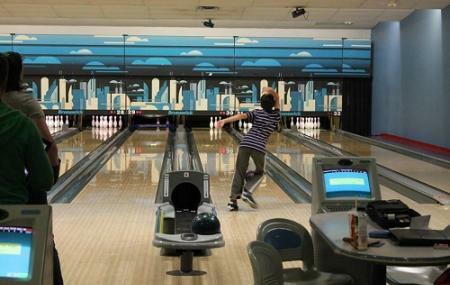 Bowlerama Barrie is quite a popular option among bowling lovers because of its excellent environment. Their cosmic sessions are also quite popular where regular lighting is replaced by black (glow in the dark) lighting and the music rocks, resulting in an exciting nightclub atmosphere. Birthday Parties continue to be a major activity at Bowlerama Barrie. Their centre offers bowling birthday party packages for the young and the young-at-heart. The place is also a popular choice among parents for throwing birthday parties for their children. Great care and attention is paid by Bowlerama staff to make sure that all parties are a success. Want to plan a DIY trip? Use Barrie trip planner for the same. Book perfect hotels in Barrie like Comfort Inn Barrie, Quality Inn Barrie and Holiday Inn Barrie Hotel & Conference Centre. Draft the best Barrie vacation packages using ideal templates offered by TripHobo. Also explore how to reach Barrie on the go! I went bowling on a busy Saturday night. The staff were really nice and accommodating and got our party of 4 a lane earlier than anticipated considering how busy it was. The lane we got was clean and everything worked as expected. We stayed for about 2 hours and played 3 games of 5 pin. It was really fun and others around seemed to be enjoying themselves quite a lot as well. The price was fairly reasonable if you split the cost of the lane between the party. The only reason I gave a 4/5 is because the whole experience felt very dated. It seems to not have changed at all since I last went in the 90's. This can be nostalgic for some but for me it shows a lack of investment to stay current. All in all I had a great time out with our party and would definitely go back to have a fun few hours with some friends. Maybe next time I'll try some of their food/drinks. One of the most amazing bowling places to go to!! You can book birthday parts here there's a mini arcade area for your kids to go and play. There is glow and dance lights for big parties. You can also get into bowling teams and compete your way to the top of the leader boards!! Get your family and friends and come have some fun!!! Best place ever!!! Great place for some fun. Gentlemen working there were great. Fast and friendly service. Thank you! Great bowling alley with glow in the dark bowling at night. Great place for a function, family outing or just hanging with friends. There are also a couple pool tables there, beer/liquor as well. Been there for a couple kids parties as well as thrown my own company nights there as well and it was great. Burgers aren't bad either. I love this place! So happy it has lasted this long. Always a really layed back environment, Food is a little pricy but it's worth it. And the staff are always friendly and professional. Also love how it still has that 90s strip mall feel to it.